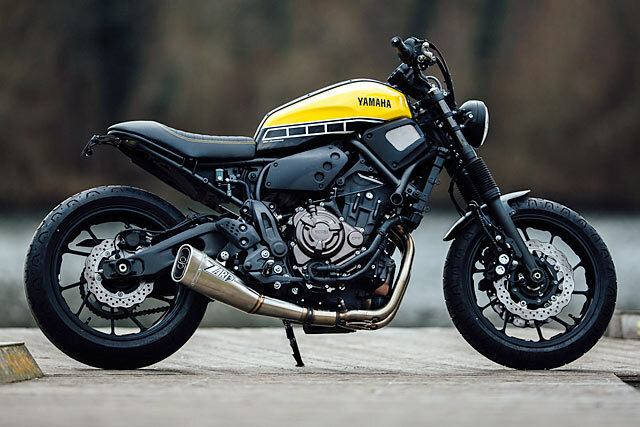 The tracker is literally a twin special, an XSR adding some vintage flair to the MT range and also a 60th Anniversary factory special in Yamaha’s famous yellow. “My biggest problem was to find a start. This bike is so different from my usual suspects,” explains Tom. 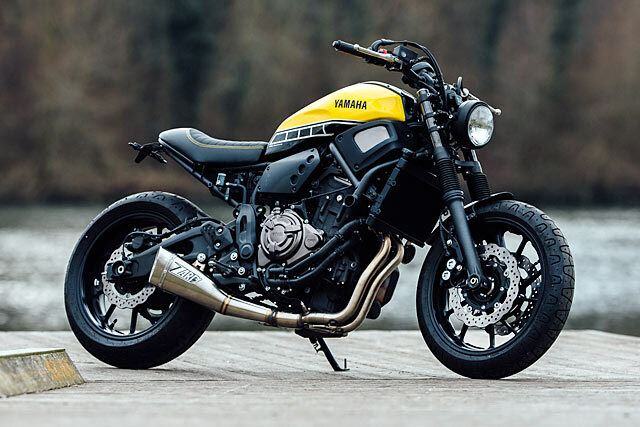 His bread and butter might be Kawasaki’s W650, but while the XSR might share the parallel twin platform that’s about where the similarities stop. 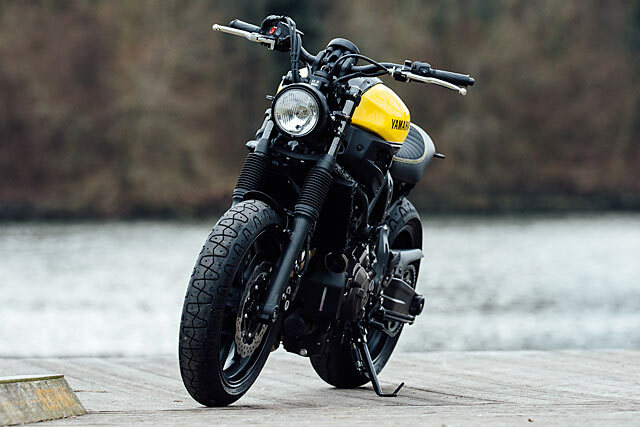 “It took me a few hours with spending my time just staring at the bike in the cold garage,” a clearly exacerbated builder sighs. This is one of the problems with factory specials; the manufacturer has already done half the work and generally dictated the theme and style. So for a creative mind so used to working with a blank canvas it can be worse than being offered up a rusty mess. 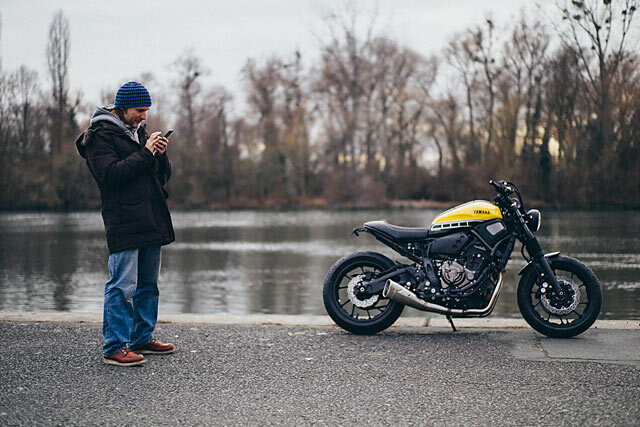 That was until Tom decided to fire the XSR into life and take it for a blast! “Later I tried the bike and it is amazing, so easy to ride, but some ugly spots on it and a terrible sound, like a sewing machine,” laughs the Schlachtwerk boss. So the plan was set, cleaner lines, remove the ugly bolt-ons and give it a screaming sound! The first port of call was to strip down the rear end and shorten things drastically. The new subframe gets the length just right, no more numberplate hanging a mile past the tyre. The fender has been eliminated with the tail light, small indicators and plate holder all built into one slim piece. While the new subframe itself blends seamlessly into the stock frame with the sort of lines Yamaha really should have offered from the get go. 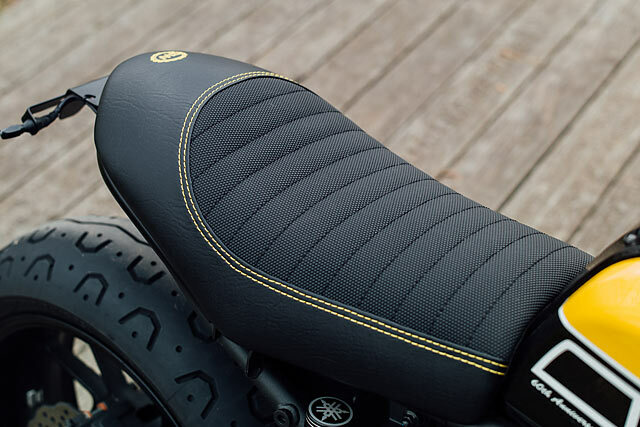 The seat was especially made for the build, black leather with yellow stitching, a perfect match for the 60th Anniversary Speed Block colour combination. Being the Anniversary edition, the XSR also comes fitted standard with ABS brakes, which is a good thing given the engines surprising performance. 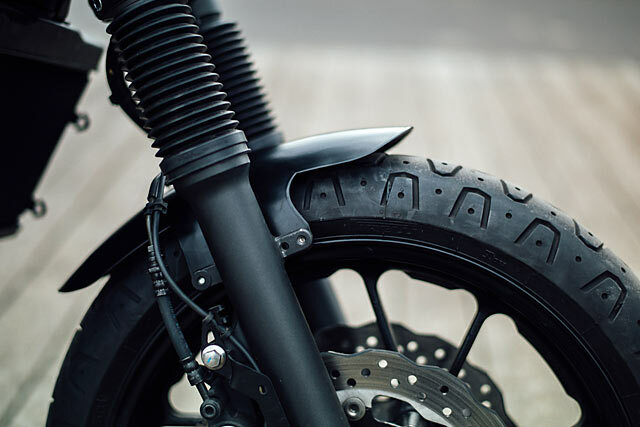 The 4-pot calipers clamp wave pattern drilled 284mm discs up front, while the rear benefits from an upgrade to the master cylinder and reservoir combination. The standard suspension is nigh on perfect, so Tom fitted up a pair of gaiters to give the telescopic forks a more aggressive vibe. While reducing the weight below the trees is a neat mini front fender doing away with one of the few factory “ugly spots”. For all the joy the engine had given Tom on that first ride the sound had left a lot to be desired. So to extract some more ponies and elicit a more pleasurable aural experience he fitted up a full exhaust system from Zard. Now the sound of the 270° crank engine can really come alive and spit the odd flame on over-run. To toughen up the engines look the covers of the factory radiator were stripped away and the whole lot painted an engine matching black. 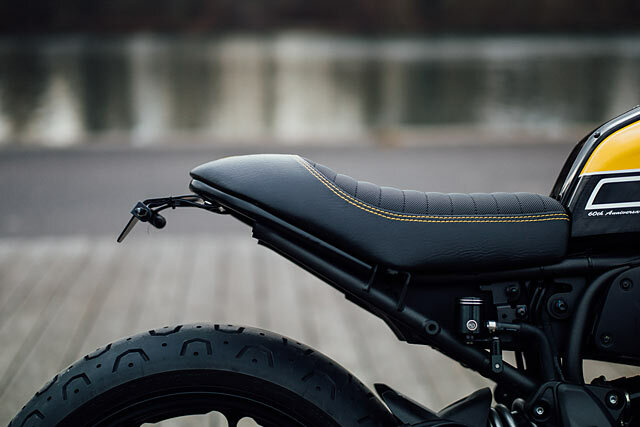 With the bike being built for his customer’s wife it was important the more compact rear extended to the front of the XSR for the shorter rider. The handlebars were switched out for a set of quality crosser items to fit her preferred riding position. 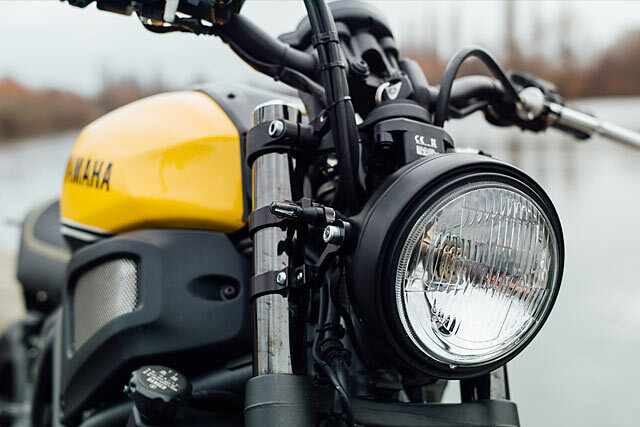 While a smaller 5 3/4″ headlight takes care of the visual size reduction; new mounts allowing it to be fitted tight to the frame. The Yamaha might have come in to his shop a new machine with just 1800km on the clock, but Tom’s sent the owners on their way with a bike that’s character defies its age. It is a text book example of creating a daily tracker that is low on price, big on personality and a smile is always just a twist of the throttle away.